Jerry Ballgame is back with his random thoughts, but has he finally stepped away from the hub? I’ve recently returned from Paris, where I was sent on a special assignment by Jobu, to study the socialist European way of covering sports. Unfortunately. I have almost no knowledge of the French language, so I was restricted to watching English channels such as the BBC, CNN International, Sky News, and France TV/English. I’ve come to the conclusion that they have a great many ‘football’ teams that play in a variety of leagues, with seasons that seem to stretch on forever, with games that never seem to have any great meaning, but each one is still talked about like it was important. In other words, like our baseball season. There were several aspects of this story that caught my attention and made me think it was worth bringing home to you. For starters, the Rangers were a successful team who had just won their league’s championship; not what you associate with a struggling team. I found the sports talk discussion on the topic interesting as well, as terms such as; too many teams in the league, out of control salaries, and the need for a hard salary cap, kept coming up. Except for the very British accents, you could have been forgiven for assuming they were talking about the NBA. Imagine my surprise when I returned to find that the Red Sox had banned pitchers from the clubhouse. Upon closer review, I realized that they were talking about pitchers of beer. Probably a logical step considering the now infamous fried chicken and beer diet was made so popular by Josh Beckett, et al, last Fall. At first, I too thought it a bit of a PR move on Bobby V.’s part until I learned that 19 other teams, including the Yankees and Cardinals, have similar bans. Let’s face it, if you can’t drink in Busch Stadium, where can you drink? I have to admit to mixed feelings about the retirement of Jason Varitek. 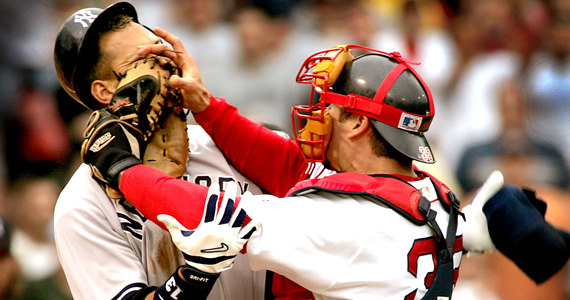 The iconic photo from 2004, of him with his glove ARod’s face, will always have a special place in my heart. There are still a great many of us who believe that was the spark that helped propel the Sox to the World Series. The fact that he caught four NO-NO’s (would have been five if Schilling doesn’t wave him off) says something about his skill has a receiver. But there are things that bother me, such as last season. If he’s such a leader, with the respect of and insight into the pitching staff, how does that collapse happen? Over the past four or five years, the rumors of his extracurricular activities have become wide spread. Just try googling him and counting how many different female reporters his name his linked with. (Keeping in mind that he was the married father of three during most of that time.) Should that matter? Does that diminish what he’s accomplished as an athlete? Perhaps not, but it does make it more difficult to root for him.If I’m going to be asked to put down what is often hundreds of dollars for a game, I’d like to be able to think that the players are both worth it, and worthy of it. I don’t need a role model, just people I can respect. So much for the editorial. An Analysis of the Sox chances in 2012, with a questionable left side of the infield, to follow soon. Now, if I can just get Jobu to reimburse me for my trip……. The check is in the mail, Jerry. Although i am discounting some of the reimbursement from the pain and suffering i went through putting that picture of Varitek on this post. Your total came out to about $50… just enough to cover your fantasy baseball fee. What are the odds? Awesome post! 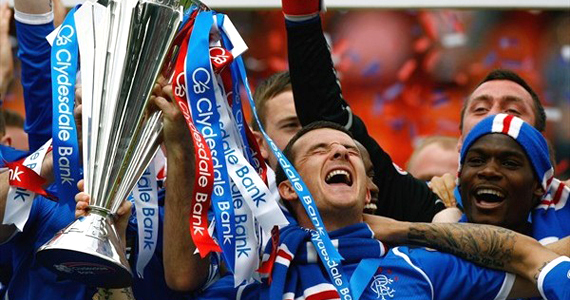 It made me want to read more about the Glasgow Rangers, for sure. Maybe i should start “sending” more correspondants out to the world.